When you think of Muslim influenced fashion in India you think of anarkalis, gauzy dupattas, tight churidars, a North Indian style that has a tremendous grip on the popular imagination not least because of Hindi movies. While the Mughals with their jama/paijama/dupatta ensembles did influence the courts of India, in reality there is a good amount of diversity with local influences intermingling with northern as well as middle eastern influences depending upon faith and denomination. Often across communities the commonality is only in head covering. Let’s start with the Bohras and their distinctive “quami libas” (loosely community dress). Scenes from a Bohra Wedding, 1940s. Bohra* Muslim clothing is quite distinctive and rich in colour and decoration, the latter of which is varied and includes laces, trimmings, zari, embroidery etc. I have been meaning to do a post forever on them but never found the right images. Then a friend – Sakina Pittalwala – posted these photographs of her parents wedding in the 1940s on facebook which are quite wonderful and detailed. Many thanks for her go ahead to post the photographs on this blog! That’s just a little sampler, if you dive into the photographs there is a lot of detail, the most distinctive of which is the bride’s tiara and matha patti. 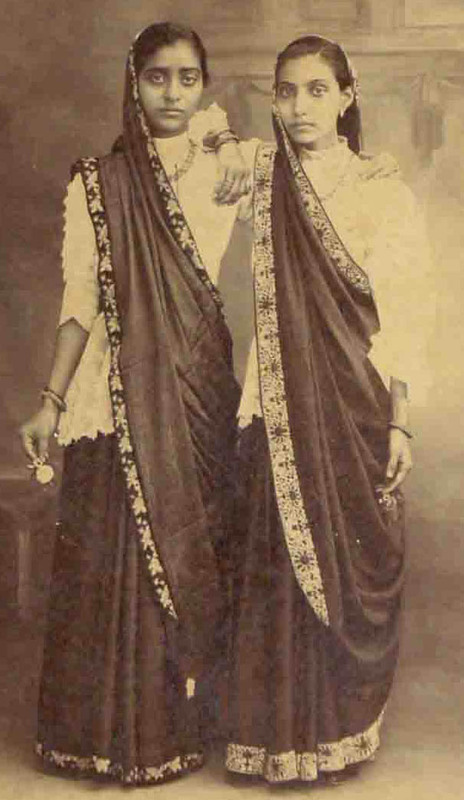 Notes: In pic 4 the older standing girl has a paijama under her frock – you can see something similar on the girls in this personal album from Karachi. More images of costumes at the site here. The equivalent of the burqa or hijab for Bohras is the rida, this includes the upper garment (pardi) covering the head which comes down to the waist (some examples here). The rida is a garment which is worn outside the house and like all Bohra clothing has rich colours and decoration. The girls in today’s photograph set are in frocks (fairly common in India in the 1940s) but here is a little charmer in HK wearing a jabla-izar (tunic-pants) and decorated topi. Please do keep in mind that these are images from a personal album and do not misuse! *See also X, X, X.
Atiya Fyzee (pic 1) and her sister Nazli with the Nawab of Janjira (Pic 2). Atiya Fyzee’s parents were Sulaymani Bohra (her uncle was Badruddin Tyabji). 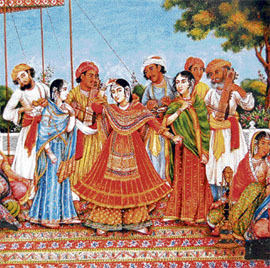 Given that the Fyzee girls preferred to be unveiled and were amongst the first Muslim women to study aboard, it appears that their costumes include a number of modifications (much like Jnanadanandini)-here they seem to feature a full skirt, lace blouse and a half-saree like drape (this drape as can be seen is worn in a particular way). Like Parsi, Bohra and Khoja costumes in Western India, the garments make ample use of trimmings, lace and embroidery (please note however that the costumes here are different from the Bohra ghaghra-badan above – dress codes amongst the Sulaimani Bohras were different from the Dawoodi Bohras and often very flexible mixing a number of elements, there is no equivalent of qaumi libas). Atiya Fyzee is now pretty much a forgotten author though she was well known in her time. Apart from her travelogue she wrote several books on music, including Indian music, which also features illustrations by her husband. She is also the subject of a recent book, on the cover of which you can see the Fyzee sisters costumes. Here are Memon and Khoja women in shirt and trousers (“kurta” and “izzar”) of green and gold or pink or yellow, with dark blue sheets used as veils, wandering along with their children dressed in all the hues of the rainbow. By-Ways of Bombay by S. M. Edwardes. 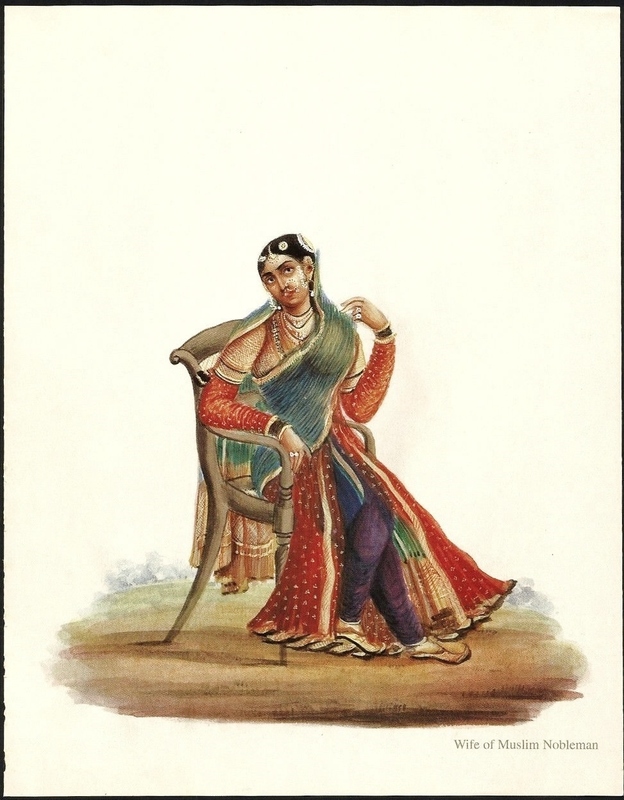 MV Dhurandhar illustrations of Memon and Khoja costumes in Western India. Pics 1 and 2 are of Khoja ladies. Lots of trimmings. The wide paijama harks back to the early 19th century in Northern India. Pic 3 is of a Memon lady, you can see the paijama beneath but hard to say if its a sari or two pieces of cloth. There was no specific dress code for Khoja and Memon women so there is an intermingling of elements, further it is likely the above costumes are no longer the norm. 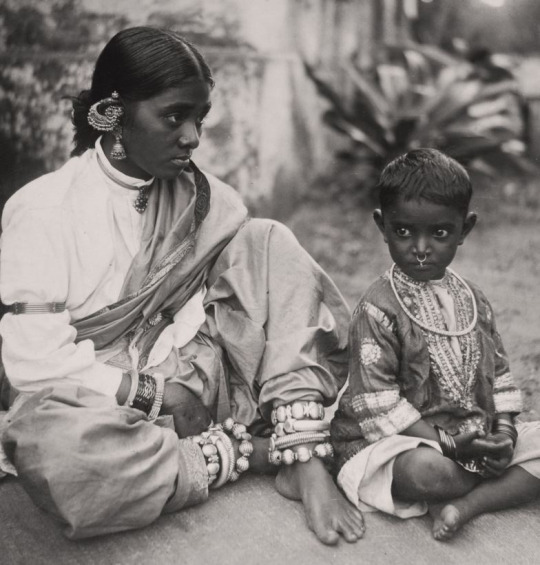 In some parts the sari or a version of it can be seen as in this photograph of a Muslim Lady and Child, in Ongole, Andhra Pradesh. (1921, Maynard Owen Williams). A lot of heavy jewellery (silver?) including an armband over a full sleeved blouse. I think the lady is wearing a sari. The child’s silk tunic is of a kind common at the time. The head jewellery in the above portrait seems to indicate that the lady is from the South of India, most likely the Deccan. There is a good deal of layering in the costume – I reckon this is a 19th century print. And curiously a bodice-common in South India for saris-over the open fronted tunic or jama. Kind of indicates how the basic jama/paijama/dupatta was worn differently and accessorised differently in Islamic cultures in 18th and 19th century India. [X]. See also Hyderabadi dress and Moplah dress. This list is kind of incomplete, Eastern India is omitted. For one the sari is quite common. Plus not enough good images. 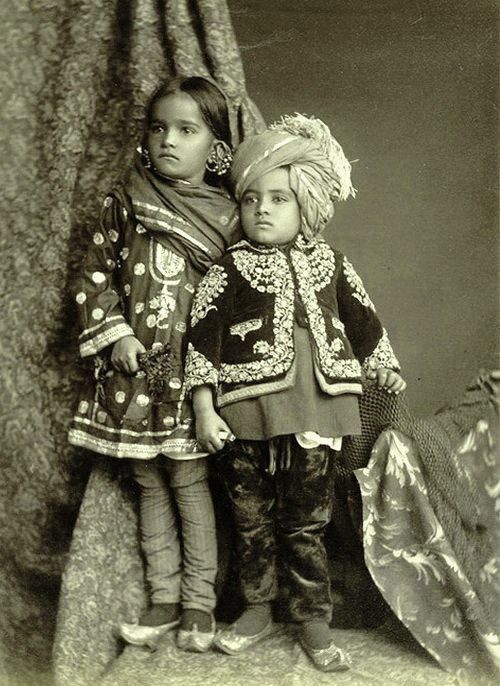 This entry was posted in 1900s, 1920s, 1940s, 19th century, 20th century, Accessories, Art, churidar kameez, Colonial, Costume, Culture, Deccan, Dress Reform, dupatta, Early 20th Century, Family, fashion, Girls, India, indian art, Indian Dress, Indian fashion, Indian Women, Islamic Dress, Islamic style, Literature, Mughal, Paintings, Photography, Postcards, regional styles, Religion, retro, retro fashion, Salwar Kameez, Sari, Sari Blouse, South India, Vintage, vintage art, vintage costume, Vintage Dress, vintage fashion, vintage photography, vintage sari, Women. Bookmark the permalink.